A: You’re already headed in the right direction. Most homeowners work around a budget before thinking about the look and feel they’d like their new spaces to include. It’s important to have a professional design and a good idea of which finishes—cabinetry, tile, lighting and flooring—you want incorporated into your plan, first. When it comes to cabinetry, I use and recommend the Haas brand. It’s manufactured in Indiana and the company is owned and operated by a third-generation of the founding family. Not only that, the quality of the construction is far superior to many of the commercialized brands we’re familiar with. Like Moore Home Remodeling, their name is on their work. Haas offers more finishes than you can count and the crew can color match any custom color you may want. There is also an excellent selection of door styles that come standard and no-cost upgrades, like edge profiles, that other companies typically charge for. Unlike most brands, Haas offers solid, well-constructed features, like dovetailed drawers and non-standard sizes, at basic prices. Moore Home Remodeling is honored to have been selected as the only qualified dealer in Northeast Ohio to offer this exceptional brand. The best part is, because Haas is family owned, the company can respond to the economic climate—and it has. You’ll find that semi-custom Haas cabinets are competitively priced, often the same as the lesser-quality brands found at box stores. Give us a call when you’re ready to get started on a design and we’ll help you create a kitchen that matches your vision—and your budget. The Showroom Comes to You! 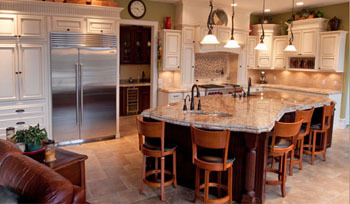 After more than 15 years in the design/build industry, Brent Moore, founder of Moore Home remodeling has perfected the art of helping clients make dramatic kitchen improvements on a realistic budget. Photos by Benjamin Margalit/Margalit Studio. by Beth New comb in Mimi Vanderhaven Pub. Door-to-door brush salesmen, makeup, vacuums, and even food. Remember when we associated exceptional service and quality with an in-home experience? It was better when someone brought the thing we wanted to buy into our homes for us to see and experience. Brent Moore, owner of Moore Home Remodeling, is on a one-man mission to bring back the kind of service that largely seems to have gone by the wayside. Instead of expecting his clients to visit a show room with magazine clippings, photos and blueprints of the kitchens and bathrooms they envision for their homes, he’s bringing the showroom to them. “How can I really understand what my clients are talking about changing if I haven’t seen what it is that they don’t like?” he asks. Moore Home Remodeling specializes in updating and replacing kitchens and bathrooms of all price points and degrees of complexity. 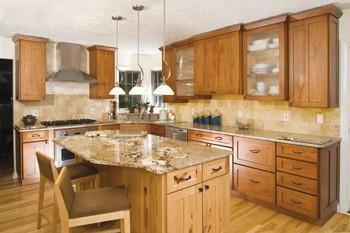 Re-Imaging is Moore Home Remodeling’s proprietary method of making outdated cabinets fresh and relevant again. Another option is a partial re-Imaging. quality cabinets in the sizes you need while matching door fronts on all cabinets to make them blend seamlessly. If a complete kitchen remodel is in the plan, Moore Home Remodeling offers clients direct access to the exquisite Haas line of cabinetry and components, as well as premium finishes like granite, hardwood flooring, and more. Instead of passing the expense of a big show room on to his clients, Brent passes on the savings of not having one. But if you must leave the comfort of your home, he does have partnerships throughout Northeast Ohio with product retailers who carry items like plumbing and lighting that you can pick from. “We only do the job if we can do it the right way,” he marvels. Moore Home Remodeling has received [many] accolades and awards for general remodeling and kitchen and bath remodeling —they must be doing things the right way. Moore Home Remodeling has received an A+ rating from the Better Business Bureau. To reach Brent Moore, call 440-941-4MHR(4647). To learn more, visit http://www.MooreRemodeling.com.